Pavement ads. Reverse graffiti. Clean art. Whatever you want to call it, there’s one thing for sure: our street stencils are a highly effective way to get attention since the floor is rarely used as a communication medium. We offer a variety of options so you can be sure to get the message across in hyper-targeted outdoor locations. We’ve delivered countless stencil-based campaigns and have received fantastic feedback from our customers and people on the street. As well as always getting noticed, you can place your adverts in almost any location. What's more, we use biodegradable paints and offset some of our water usage by supporting Water Aid to leave the smallest environmental footprint. Also known as 'clean advertising', we use specialist jet-washing equipment to clean a stencil imprint onto the pavement. With over 10 years of experience, we consider ourselves to be the best in the country. Using eco-friendly, biodegradable chalk based spray paint, this option will leave a bright impression on the pavement. Tested to withstand heavy footfall and rain, and available in a wide range of colours, this is colourful, highly-targeted advertising that delivers fantastic results. Artwork is prepared as a stencil. You can provide your own artwork but creating stencils needs experience to ensure the impression works correctly, so we can do this for you if necessary. The stencils are cut from a durable material, which can be reused for future campaigns. Briefing. We brief our team on the project including locations and, if we are undertaking a large synchronised campaign we ensure that all teams are working simultaneously. Application. For reverse graffiti, the team use professional jet-washing equipment including a 600 ltr capacity water bowser and pressure washers with 3,000 psi pressure to leave a clean impression on the pavement. For spray painted ads we use eco-friendly, biodegradable spray paint. 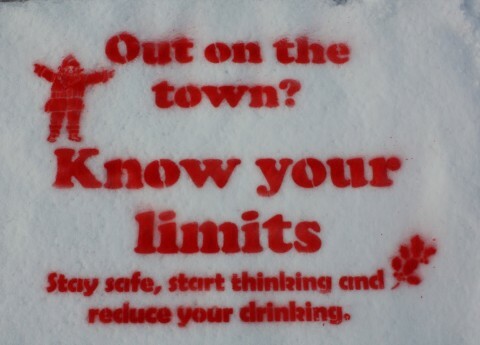 We've also used unconventional materials such as mud and can even spray paint stencils onto snow! Quality control. Location and type of surface can affect the quality of impression - this is where the experience of our team ensures we get the best results. We clean away adverts that don’t meet our quality standards. See the campaign live. We use a camera that has GPS built in. This means every picture taken has a GPS locations data attached. When we upload the images to our web album, you can see exactly where the picture was taken. You are free to download the photographs for use in your PR campaigns. Removal. Pavement adverts are removed using water, a stiff brush and a touch of elbow grease, or simply by using the high-powered water jet wash. If you would like to use our street stencil services for your next campaign, or are curious to find out more, please contact us and we'll be happy to help.